His drive to learn on the farm and in his fishing adventures grew with him as he completed his studies at the Pohnpei Island Central School and further at Hawaii Loa College. His knowledge and skills in technology gave him determination and his hands on training provided him a strong work ethic. My dad built an outstanding career having stayed and contributed to the development of our own FSM Telecommunications for over 25 years in their IT Division. My dad is a true representative of the people. A true son of the soil, my dad is well acquainted with the problems and grievances of the people. Before Congress, he was a local councilman for his community for 12 years. During this time, he was elected twice as a Constitutional Convention Representative – once for Sokehs Local Government and another time for Pohnpei State’s Constitutional Convention. I believe that this is where he developed his passion for service to his people. As a councilman, there were many significant changes in his community that he was heavily involved in. For example, my dad helped negotiate easement rights for road on the island of Sokehs to be connected. As councilman, he was directly involved in the cleanup of the channels around Sokehs including removing all debris around the island and under the bridge in Sokehs. Also while councilman, my dad was a Board member of Pohnpei’s Environmental Protection Agency or EPA and had an integral part in the removal of all pig-pens and benjos on the shorelines of the island of Sokehs. In fact, he was a member of the EPA Board during the latest cholera epidemic. During this epidemic, the Board sought & received grants for low-income families to build their own working toilets, many of them being first time owners of indoor restroom facilities. Prior to joining Congress, my dad was already involved in many community projects, many times doing them on his own time and with his own resources. If you are one of many who eat lunch or hang out in our causeway, you will be pleased to know my dad built all of those huts out there with family outings and activities in mind. Being a family man, he knows many people from the villages do not have venues to eat during their lunch hour as they travel long distances every day to work in Kolonia. These huts provide for such place so people can take a break, enjoy the scenery and cool breeze, and spend time with their friends and families. Speaking of the causeway, the causeway today is lit with beautiful streetlights, a collaborative project between the Congressman and Pohnpei Utilities Corporation (PUC). The streetlights now run from the causeway all through Kolonia town and all the way to our Nation’s Capital and more are coming. My dad recently installed streetlights up on Sokehs Ridge so it is safer for hikers and adventurers on their early morning and evening walks. I think the streetlights not only provide safety, but they beautify the island, something that is important to my dad. My dad has done a lot of worthy things for his people, too many to list -- many of these things a first for people in his community. Solar lights for students and senior citizens from the outer-islands who had never before enjoyed the amenities of electricity like we do on the main island of Pohnpei. Students from there can now study using their solar lights instead of oil lamps. Desalinization equipment now exists on some of our outer islands producing 500 – 1000 gallons of water per day to those who need it. Communication towers on remote islands such as Pakin (the first of its kind) that not only help fishermen communicate to the mainland if they encounter trouble beyond the reefs, but enable many families to communicate to their loved ones abroad through the web on skype, email, and Facebook. It is hard to believe that in this day and age, there are many citizens of Pohnpei who have not enjoyed the benefits of electricity and running water, not to mention drivable conditions to their homes which are very basic necessities. My dad has helped many of these families by facilitating the funding necessary to construct or repair roads that have enabled these working families to, for the first time now enjoy working utilities that otherwise would not have been afforded them due to poor conditions of their roads. 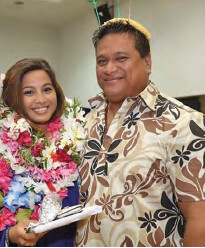 Within the short two years alone, my dad has supported many public projects and community activities, including much needed road expansions (example: tuna commission one-way road expansion to ease up traffic), sidewalk expansions to benefit pedestrians, especially students who walk to and from school, construction and renovation of community centers for women and youth groups, General Education (GED) programs for many young people who want a second chance at schooling, Wi-Fi connectivity in many public areas including community centers, churches, our own hospital and airport, etc. Our airports look more modern now with extra seating made available to everyone and beautiful local plants that are enjoyed by the many patrons of the airport, visitors to Pohnpei, and locals alike. Never before school related activities that directly benefit our children including the first ever testing of school children around Pohnpei on rheumatic heart diseases, the establishment of computer labs with the latest computer equipment for our public schools, assistance given to private schools for their ongoing efforts, even so far as providing our local teachers with laptops so that they can have access to better teaching resources and materials. Though perhaps small in some ways, these are things that have never been done before and I honestly believe these projects and activities enrich our lives and benefit many of us the people of Pohnpei, but especially the young – the future of Pohnpei! I am proud of my dad for the great things he has managed to accomplish and achieve in the short time he has been with Congress. With all of these efforts by my dad, Pohnpei is a much safer place now. However, we need it to be safer. We need it to be as beautiful as it can be because Nan Madol became a World Heritage Site, the first ever in Micronesia in July 2016 – something all of us Micronesians should be extremely proud of! Our infrastructure needs to be better to accommodate these changes. Our conservation efforts need someone who respects our environment, someone who understands our Micronesian culture, someone who understands the people’s needs, and someone who is proud of being a Pohnpeian. Our healthcare system and schools need major improvements so that we can compete among Micronesia’s finest. Pohnpei needs a person who is an advocate for these kinds of improvements. Our islands need someone who has the ability, the willingness, and the passion to serve. This person is my dad, Ferny S. Perman. Being a leader, whether it be in your community or within your own family, there are always higher expectations and higher responsibilities. As a leader in the community and at home, my dad has made some mistakes over the course of his life, but he is no doubt a dedicated husband and a loving father. My dad has taught my siblings and me the value of service through his passion and dedication to his people. Even after losing many times, my dad taught me and my siblings about patience and perseverance – that it is OK to fail – what’s important is that you get back up on your two feet and try again! My dad continues to teach my siblings and me to respect ourselves, to respect our community, and to respect our culture. I am a proud Pohnpeian young woman entering medical school because my dad teaches me and my siblings the value of education. He imparts on us his children the value of love, the value of family, and last but not the least the value of hard work and dedication. Thank you Ipa. I am very proud of you!